Thanksgiving is in a few days. A time to thank everyone dear to our hearts. And what could be a better way other than serving a delicious Thanksgiving lunch or dinner with choicest of dishes. So in my ever going quest to learn something new and serve my family all of my culinary experiments, I am in the process of making a Prune Tart this time. Tomorrow I would post the recipe. Tart has been done. Filling would be made in the evening followed by the perfect click and posting. Not wasting any more time, I would come straight to point. I am going to introduce a superb sweetener, Golden syrup to all my foodie friends which I have used in this tart. Generally referred to as pale or light treacle, Golden syrup is a thick, amber-colored form of inverted sugar syrup looking just like honey. Golden syrup has an interesting story about its discovery. Way back in 1883, a Scottish businessman Abram Lyle was refining sugarcane in his factory, when he found a byproduct golden in color with very sweet taste. He took that home and used it as a spread and for making desserts. Due to the golden color, it came to be known as Golden Syrup. He first sold it to Lyle's employees and other locals. In 2006 Guinness World Records listed it as the Britain's oldest brand. Golden syrup is made from the juice of sugar canes, which is evaporated to produce the flavor and texture of the syrup. For vegans who do not eat honey, it is a great substitute for making desserts. 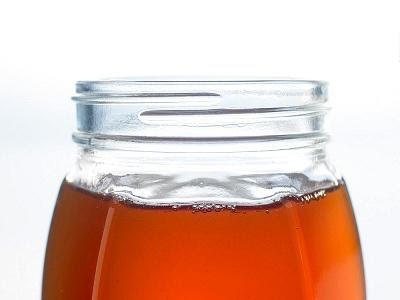 Comprising primarily of sucrose, glucose and fructose, golden syrup is easy to be stored without worrying about the low temperatures in winters. In UK it is a popular ingredient for making tarts or as a topping for pancakes. One thing that has to be taken care of is to use it in lesser amounts. It is sweeter than sugar. Syrup looks exactly like honey..
Nice click and yummy looking syrup!! !Thanks for sharing. Very informative,helpful for few of us..
Oh I love GOLDEN Syrup..sadly you dont get the same British BRand I love here in the US... now I can MAKE my own...which just HAS to be better...thank you !